pARTicipate was an exotic fundraising gala held on April 6th, under the stars and throughout the Art and History Museum’s beautiful Maitland Art Center campus, the stage was perfectly set for this Sideshow of the Senses, an interactive event that showcased local visual artists, fabulous food, and intriguing performances. The campus came to life, with every nook filled with art and activity. Guests could explore the grounds as they enjoyed a progressive dining experience, featuring cuisine by celebrated local chef Jamie McFadden of Cuisiniers. There were fine wines and beers at tasting centers throughout the campus. Art installation dining tables, created by the participating artists, offered guests a unique dining experience. 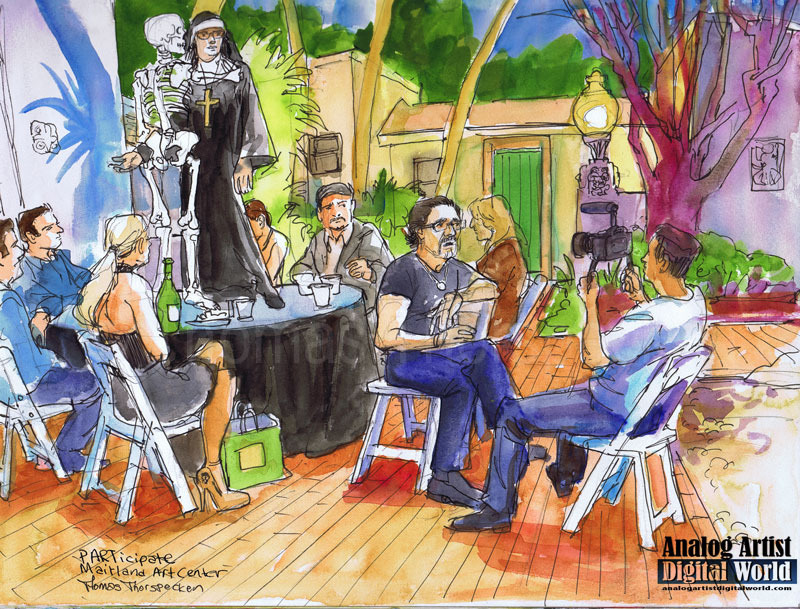 Select artists created art during the event, as they shared their stories and insights. The silent auction of artworks, donated by popular Central Florida artists, generated some lively bidding. Talented Phantasmagoria entertainers from Empty Spaces Theatre Co(llaboration), under the direction of John DiDonna, performed throughout the evening. Phantasmagoria is a local macabre performing troupe of fire-breathers, musicians, and acrobats. When Terry and I arrived, I immediately scouted around looking for my sketch opportunity. When I entered a secluded inner sanctum of the Maitland Campus I found this table with a nun standing beside a skeleton. I was certain she was a live model posing as a statue. I approached tentatively until I finally saw that her plastic gaze was eternal. I wandered some more to look at other decorated tables. Dawn Schreiner had set up a tree with play money as leaves. Each bill had one of her paintings on it. I then bumped into Camilo Velasquez. I told him about my scare with the nun, and he told me that he had decorated that table. A photographer wanted to interview Camilo and that settled the matter. I followed them back to the nun. Camilo had grown up with dominant priests and nuns in New York and he always felt like an outsider. The table design had been inspired by the art of Paul delVaux, a Belgian artist who lived through the atrocities of World War II. As I worked on this sketch, Melissa Mila Marakoff, one of the Phantasmagoria performers, slipped up behind me. She whispered in my ear, "I don't mean to startle you." I just about jumped out of my skin. She startled me half to death and I shouted out with a start. Everyone had a good laugh. It was as if death had whispered to call me away before my work was done. With the sketch complete I grabbed a few morsels to eat. I sat at Dawn Schreiner's table and after a few texts, Terry found me there. Dawn started disassembling her table display. Two small doves were in a cage hanging from a tree. I hadn't noticed them until Dawn pointed them out. They were puffed up and snuggled together. Dawn's play money paintings had a draw back in that some patrons thought they could take a painting if they replaced it with a real dollar bill. Obviously these patrons didn't know the true value of her work. The pARTicipate Event raised over $30,000 gross, $18,000 net, with proceeds benefiting art and history programming at the Museums. Bats fluttered in the darkness as Terry and I made our way back to the car. 9:30am - 5:30pm Orlando Anime Day $3 International Palms Resort & Conference Center 6515 International Dr Orl FL 32819. One day anime marketplace that brings all your anime/manga needs to you & Features over 2,000 sq ft of dealers, Video/Event room, prize giveaways, raffle drawing, cosplay, & FREE Parking. 1pm - 3pm FREE Plein Air Paint demonstration by Frank Ferrante. Cottage, located on beautiful Lake Lily park in Maitland. The demonstration is FREE and all are welcome to attend. This Plein Air influenced oil painting demonstration is for painters who want to develop a sound understanding of the fundamentals of outdoor painting. The demonstration will focus on the formal elements of painting composition, color values, structure and form. Emphasis will be placed on composition, capturing light and dark shapes, atmosphere and mood while using strong color harmony. We hope to see you at the Cottage this Saturday! 7:30pm - 9:30pm Coupled: The Game Show & Game Night. The Abbey 100 South Eola Drive, Orlando, Florida 32801. Tickets, which are $12.50 per person, can be purchased online in advance as well as at The Abbey. Created by Curtis Earth Entertainment and Great Dates Orlando, Coupled begins with a hilarious interpretation of the classic he said/she said Newlywed Game, the event will invite 6 couples to compete on stage for prizes as they demonstrate how well they REALLY know each other. Of course, Curtis will be mixing in trivia throughout so audience members can win some fabulous prizes too! Immediately following the ninety-minute show, classic board games (Sorry, Connect Four, etc.) will be set up at tables throughout this posh venue so you and your sweetie can continue the fun well into the night. In addition, we’ll be playing Twister, Musical Chairs, and Dance Freeze on the dance floor. Expect lots of prizes, drink specials and more fun than you could ever imagine having on date night. 9pm - 11pm FREE: “Comedy Open Mic” Austin's Coffee: 929 W Fairbanks Ave Winter Park, FL 32789. Free comedy show! Come out & laugh, or give it a try yourself. Labels: Artists, Camilo Velasquez, Cuisiniers, Dawn Schreiner, Fundraisers, Jamie McFadden, John Didonna, pARTicipate, Paul delVaux, Phantasmagoria, The Art and History Museums of Maitland, The Empty Spaces Theater Co.